As fall rolls around each year, you are likely to find me in my kitchen making gingerbread. My mom discovered this recipe when she stayed at the romantic B&B called Inn on the Creek in Salado, Texas. I believe, with all my heart, that it is the best gingerbread recipe on the planet! Add eggs to buttermilk. Blend and set aside. Combine brown sugar and flour. Cut in butter. Reserve 1 cup of mixture for later use. To remainder of sugar mixture add baking soda, ginger, cinnamon and nutmeg. Stir in buttermilk mixture just until all ingredients are moist. Pour batter into 9 by 13-inch greased and floured metal baking pan. Sprinkle reserved cup of sugar mixture over top of batter. Serve with mounds of freshly whipped cream. 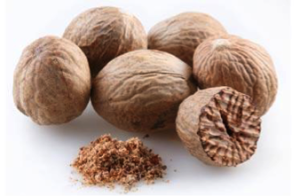 Use a grater to get fresh nutmeg. I know, it seems like extra work…but once you taste it, you will never want your nutmeg any other way than fresh! oz: the blog of glenda sims ( the goodwitch) is powered by	WordPress 4.8.9 and delivered to you in 0.277 seconds using 20 queries.